It is great for kids to learn about the importance of healthy teeth and maintain the same for their lives to come. We provide various dental plans and treatment for children of all ages to help them be confident about their smile. Our staff create a welcoming environment for children and make sure they are entertained and never have to feel any anxiety or fear. This has helped us achieve overwhelming results in kid's dentistry in Gurgaon. Our kid's dentist in Gurgaon help kids learn more about their teeth and undergo treatments with a smile. Don’t we all love kids ? It’s but natural for kids to learn from their own experience and enjoy the little joys that life has to offer. Improper and delayed Dental Care often create dental conditions that are can affect their dental health. We provide flexible plans for preventive dental care for kids so that you do not have to worry for your child any more. Our team of kids’ dentists in Gurgaon, led by specialists Dr. Mrs. Sanju Khullar, are specially trained to manage children and their anxiety on the chair while providing world class solutions. It's been 6 years I have been taking Rahul to Dr Khullar's in DLF. The doctors have been supportive through out and Rahul loves them. 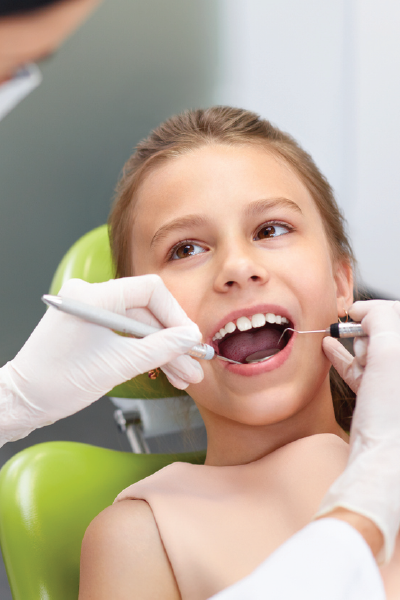 Our team of dentists can provide quality dental services for children of all ages. We provide braces, cavity filling, teeth cleaning and other services for children. Contact our Kids’ dentist in Gurgaon to ensure complete oral health of your child. We offer kid's dentistry services in DLF Phase 5, Naraina Vihar, Golf Course Road or Sohna Road. © DR KHULLAR 2017. Made by NHPL.